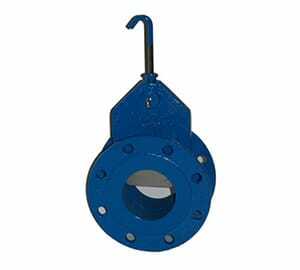 Flanged blast gate valves are made to optimize the safety and efficiency of a furnace, boiler and similar equipment. These devices are specially built and carefully tested to ensure they stand up to high temperatures and intense internal environments while regulating fluid or air flow properly in a wide range of applications. With a variety of sizes and configurations, you can choose the right blast gate valve for your needs, from smaller components requiring a 3-inch blast gate to larger equipment requiring a 16-inch blast gate, and everything in between. Flanged blast gate valves use a clear window made from quartz clear class or Pyrex clear class, also known as borosilicate glass. With quartz glass, the window will withstand temperatures as high as 1,600 degrees Fahrenheit. The lens is situated in a carbon steel or stainless steel body with a self-cleaning stainless steel slide. Flanged blast gates are best suited to low-pressure environments and are generally used to control air flow or enable viewing of a container or vessel. The flanged blast gate is designed to deflect heat away from the viewer or operator, allowing them to be used safely in even the hottest conditions. The blast gate valve can be adjusted or installed to best suit the viewer or operator and the surrounding facility, creating the safest, most efficient and comfortable environment. Flanged blast gates are available in a range of different sizes, with customizable options available for each model. Choose from quartz or borosilicate glass options as well as carbon steel or stainless steel housings, depending on what works best for your needs. For assistance selecting the right flanged blast gate valve, call Gage Glass today at 800-780-3776.